With a wonderful array of conceptual ideas and supercar exotica, it’s all too easy to be swept away with the headlines and forget the everyday cars that make the Frankfurt Motor Show such a success. That’s why HonestJohn.co.uk has travelled to Germany to trawl the show halls to find the best Frankfurt has to offer. This year’s show has been a bumper one for MPVs and fans of small and economical cars. What’s more, we’ve also spotted a Porsche that was almost completely forgotten about in the sea of praise for the 918 Spyder hybrid. So check out our top five hidden gems and discover what you might be driving in the next year or two. With the 918 Spyder hybrid dominating proceedings at the Porsche stand, you’d be forgiven for thinking that the story ended there. 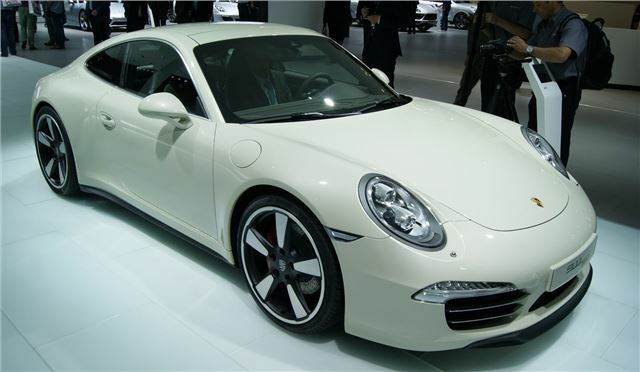 However, Porsche had another car up its sleeve; in the form of the 50 Years Edition 911. Based on the Carrera 4/4S, the 50 Years Edition gets the wider body of the Carrera 4 models plus the Porsche Active Suspension Management system. Just 1963 cars will be built and each will be powered by a 3.8-litre flat-six engine with 400PS. Top speed will be a respectable 186mph, while it will return 30mpg on the combined cycle.